Today I spent around six hours in our new house, stripping. Sorry but I don't think that joke will ever wear thin for me! If you've been following my House Renovation series, you'll know that we bought a house at the end of last year, but have not yet moved in. That's because we are hoping to do some building work soon to extend it, but also because it belonged to an elderly couple and everything inside was very dated. For a house tour as it was when we purchased, click on House Renovation Part 1 (but you may also have to click onto part 2... ;)). We are hoping to move in later this year once a large part of the building works have been completed - fingers are very tightly crossed. In the meantime, there is much work to be done, and outside Mr C has already managed to craft us a new drive, which is quite impressive. Meanwhile, I've been working hard inside. 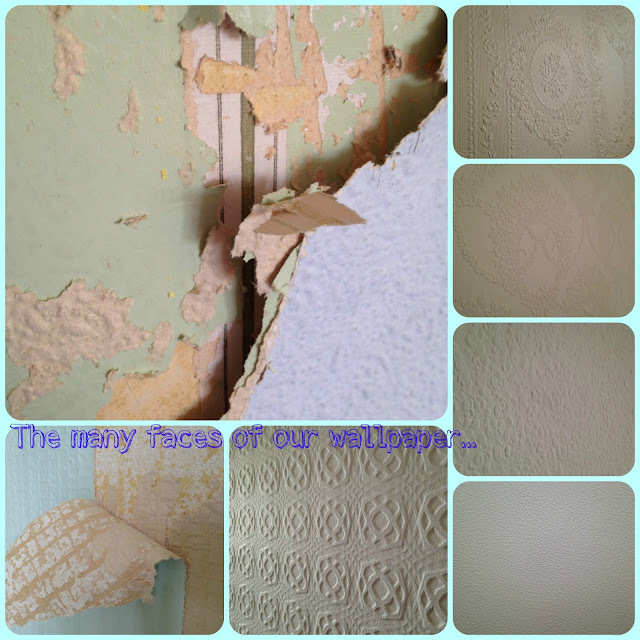 Every single wall in the existing house is covered in flocked, textured wallpaper, which was loved so much in the 70s of course. There's even a pink bathroom suite and separate toilet! It reminds me so much of the house where I grew up... but this is the 2010s and we need to bring it a 'little' more up-to-date. Scratch that, a LOT more up-to-date. So the wallpaper needs to go. The existing walls are mostly staying luckily, but there's a few extra ones to be built - down the side and out the back, and then up into the loft, meaning a whole new roof... gulp. All these plans are exciting of course, but sadly likely to cause more than a little dent in the bank balance (what balance?!). It could be that we will have to look for a home improvement loan as there's just so much to do - kitchen, bathrooms, sofas, paint.. etc. We're just at the stage now where we have asked a few builders to come back to us with an estimate of the costs involved, and I'll admit to biting my fingernails. So alongside all the 'fun' of choosing new flooring, and tiles, and 'colours', goes the stress of not knowing how much we'll actually have left over for the 'nice' stuff. The A Word Part 2: True to Life?